Made in a 150-year-old Minnesotan mill, this throw has a lightweight weave that’s good year-round. The raw wool has natural stain-, wrinkle-, and water-resistant properties that make it easy to care for. The Faribault Mill made over 250,000 blankets for American troops in World War II and still uses many of the same machines and techniques. Dimensions: 50" x 72" x 0.25"
These heirloom quality, 100% pure wool blankets are stain-, wrinkle-, and water-resistant—and Made in the USA. And they’re made to last for years and years. For five generations, the Faribault Mill has spun together a tight knit community of craftspeople that take the raw wool and transform it into high quality blankets. 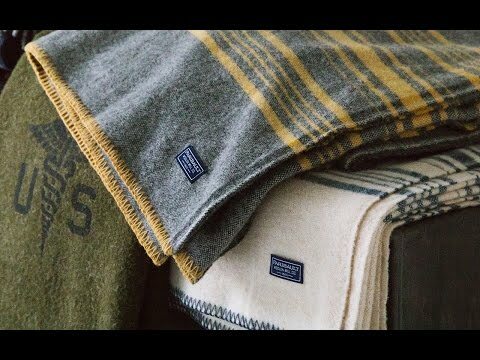 This Minnesotan mill been around for over 150 years—using some of the same techniques and machinery that made 250,000 blankets for soldiers during WWII. The wool they use has active properties that react and adapt to changes in your body temperature. It warms you up if you’re cold and releases heat and moisture when you’re hot. Propelled by a legacy of careful craftsmanship, Faribault blankets will be keeping your family warm for years to come.